We sometimes get the left over spent barley from making beer at a local brew pub. The smell is lovely, like barley soup – something I love. The consistency is more like oat meal, perhaps a bit drier and not as sticky. The spent barley is high in fiber, minerals and protein. The process of making beer involves steeping the barley to capture the sugars which are then fermented by the yeast. The spent barley is left over from this process. Rather than throwing it out as used to be done the pub gives it to us which saves them a lot of money on hauling. It gives our pigs, chickens, ducks and geese a bit of extra protein when available adding to what they get from pasture/hay and dairy. This is one of the things we are generally able to pick it up on our back-haul which saves on driving by carefully scheduling our delivery route. We deliver meat to the restaurant and pickup their the spent barley from their brewing beer. That way we’re always running loaded. Six months later we’re back at the brewery with the pork that was grown using that barley, our pastures, winter hay and the dairy we get from a local cheese maker. It’s a cycle that keeps the good food stuffs from going down the chaos slope. Waste not, want not. To learn more about what we feed our livestock check out the Pigs Page and the articles tagged as Feeding. And THAT, folks, is what it’s all about! I like that cycle . . . haul pork one way and boiled barley home again. And each trip benefits the receiver. Waste not, want not. And Use it up or wear it out. I think you were “Green” way before it became politcally correct. As were my depression-era parents. Lessons well taught! That barley would have to be malted, correct? My understanding is that it is malted barley which means to the grains are sprouted. I don’t know much about beer making. The malted barley is not boiled in the brewing process. The grains go through a process called mashing. Hot water is added to the grains, usually around 160, and held at that temp for about an hour. Mashing uses the enzymes in the grains to convert the starches to sugars. In the next step, the grains are rinsed with hot water to extract the sugars and collected in the boil kettle. This is called wort. The wort is boiled and hops are added to counteract the sweetness of the wort at various times during the boil. Hops added early on add bitterness, hops added closer to the end add aroma. The wort is then cooled to about 68 degrees F or so, is transferred to a fermenting vessel, and yeast is pitched in. The yeast converts the sugars to alcohol and wham — you’ve got beer. The early colonists that founded this country often used squash and pumpkins as a source of fermentables in lieu of malted grains. They also used spruce tips instead of hops. Everyone drank beer in those days because it “cleaned” the water. Hi Jeremy! Long time no see. Thanks for the great explanation. I can see where my confusion about ‘boiled’ came from. Remember that most of the sugars are extracted from the grains. The grains are highly modified to achieve maximum extraction efficiency, so most of the sweet went into the wort. I have had pretzels made from the spent-grains (that’s the proper term Walter) in a brewpub once and they were wonderful. Yes I realize that…I meant before it is used to make wort. Ha! I was thinking how it would taste to the pigs! I’ll taste some next time I brew! Well you certainly are “pig-centric” LOL! If I am not mistaken there is malts that are roasted to the point where the enzymes are present to create the sugar during worting, then there is malts that are roasted a lot longer and hotter (carmalized) that are used for flavoring. Not sure but I think those malts are sweet. How much spent grain is reasonable to feed to the pigs on a daily basis? If you’ve addressed this in another post will you please just direct me that way please? ( I looked but I didn’t see it.) Also, how well does the spent grain keep? I don’t have an exact answer for you but check out this post on Feeding Barley. One concern is that barley is very high in protein which can cause kidney failure and burn out. I would not free feed it. But then I don’t have that as a problem because we only get a little barley which is distributed between 400 pigs each week. If I had unlimited barley I would run a Pierson’s Square on it and aim for 12% to 16% protein. See the article I linked to about feeding barley. In the cold of the seasons the barley keeps fine. 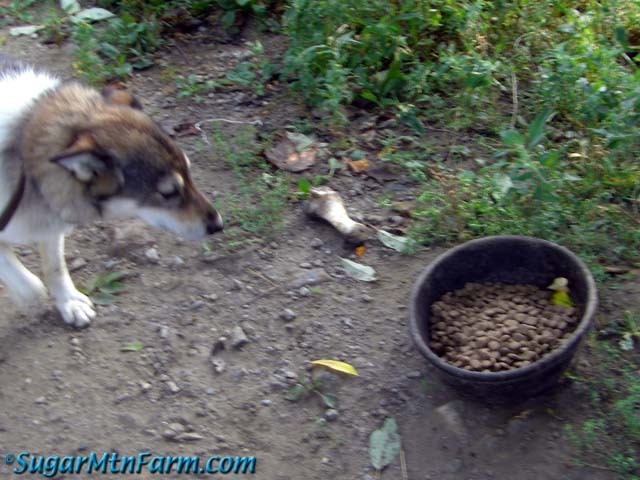 In the summer you want to feed it out within a couple of days or it goes bad and then you should compost it. Mix it with plenty of carbon for composting. When we feed barley we mix it with hay, apple pomace, butter or peanut butter, etc as available. I would guestimate that our pigs are averaging about 0.14 lbs of spent barley per hundred weight per day – except they tend to get it all in one day or two days each week since that is the schedule we get it on when it comes. I think they would love to get four pounds of the spent barley per day which would be about 28 times more than we have available. Note that it is unwise to feed whole, unsoaked or uncooked barley as it will just pass through the pigs. You can do a very expensive starvation diet feeding them unlimited barley this way. The chickens will love you though. See the photo this post. That manure was from the Tamworth pigs we bought last winter. 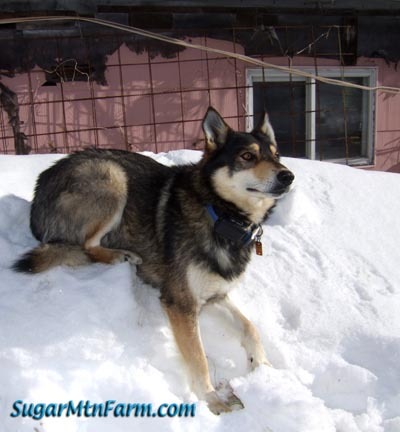 They were starving on a diet of barley at the farm that had them before they came to us. They simply could not digest it so it passed right through their gut and they lost weight. The sows were peakid at the start of their nursing time – very bad. The grower pigs were nine months old and were about the size of four months old pigs. In one month of living at our farm on hay and whey they completely recovered and put on weight to a fine condition. 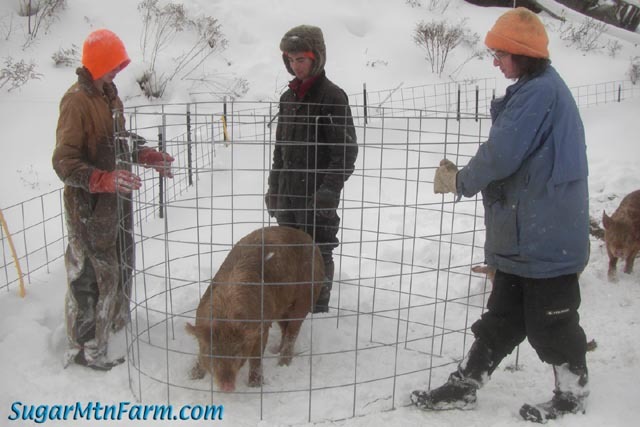 The grower pigs in that group shot up in size so that with two more months of hay and whey they were at slaughter weights of 250 lbs which is normal for a six month old pig – they were eleven months old by then. Ergo, don’t try to feed a whole barley diet. If you’re feeding barley, soak or cook it and ideally crack it too. Does it freeze in subzero weather? I’m assuming it’s still wet. Yes, sort of like a popsicle. 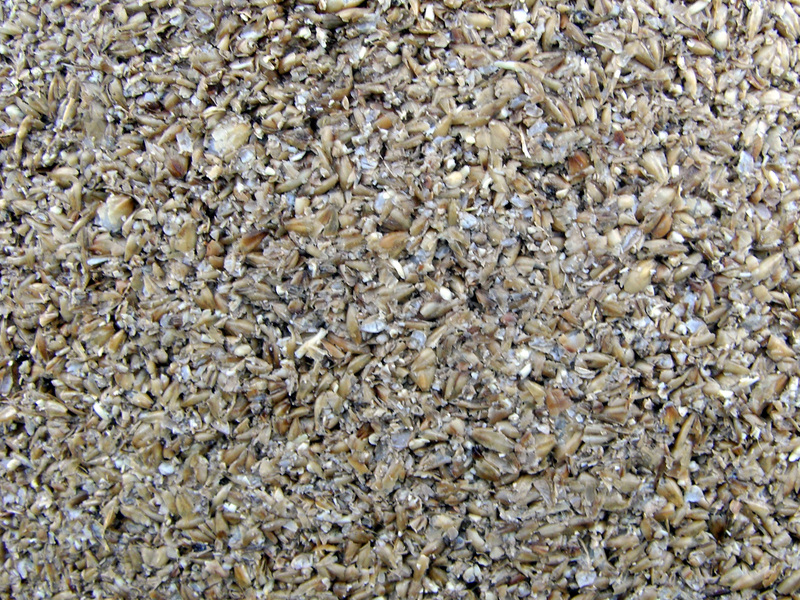 http://www.permies.com/t/34922/fermentation/Spent-brewer-grain-whey-ferment This forum says that you can feed up to 25% of a pig’s diet as spent brewer’s grains. It is primarily fiber and protein left since the sugar is leeched in the brewing process. http://homesteadapps.com/app/free/feedcalc/pearsonsquare.php Says that barley (primary component of brewer grains) is 12.3% protein and 12-16% is the range you said we should shoot for in this post. What would be a good supplementary item to cover the fats/carbohydrates void left by using as much spent brewer’s grain as possible? There are lots of possibilities for fats and sugars, energy. Too many to list. 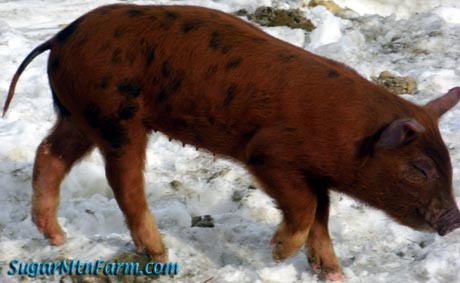 Our pigs get about 80% of their diet from pasture based on dry matter intake (DMI). About 7% is dairy, mostly whey, which provides primarily lysine. After that it is a seasonally available mix of pumpkins, sunflowers, squash, sunchokes, beets, turnips, etc. We get a little spent barley and I would love to get 10x as much. I would suggest no over thinking the diet too much. I find the trick is to provide a good foundation of diverse pasture and then supplement as I can. 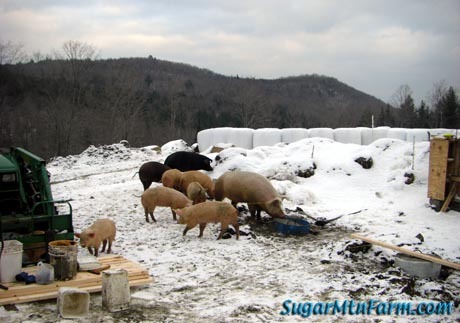 See the notes about feeding and grazing on the Pig Page and follow links from there. I sacrifice a little growth rate but with an extra month or two of patience the pigs get up to size nicely. Part of that is genetics, a big part is good managed rotational grazing and then there is simply experience that will come with time. You’ll develop a keen eye for how they are doing by doing it. Glad to hear about the sunchokes. I just planted my first batch of them last year and got about 20 pounds of tubers from 3 plants. Since they have the potential to grow exponentially I’d LOVE to use them as the primary supplement to sbg. I know they give gas problems, is that something to worry about? Not that I’ve seen. Might be a percent of diet issue. If I have 10 acres, 5 acres of acorn/hickory, 5 acres planted with alfalfa/jerusalem artichokes and unlimited free spent brewers grains what would you recommend as a supplement for growing/fattening phases (assume no access to free dairy). Would you only need hay for the winter for the keepers? 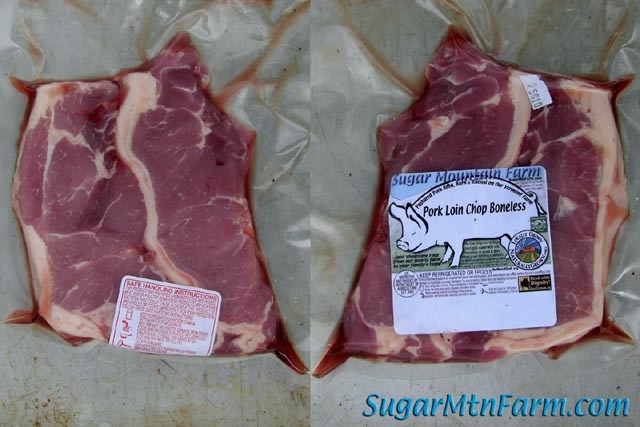 Would the only savings on http://sugarmtnfarm.com/2005/03/30/keeping-a-pig-for-meat/ costing model be the feed? Thanks for the wonderful responses so far. Nuts are protein for muscle building and lipids which are energy for fattening. 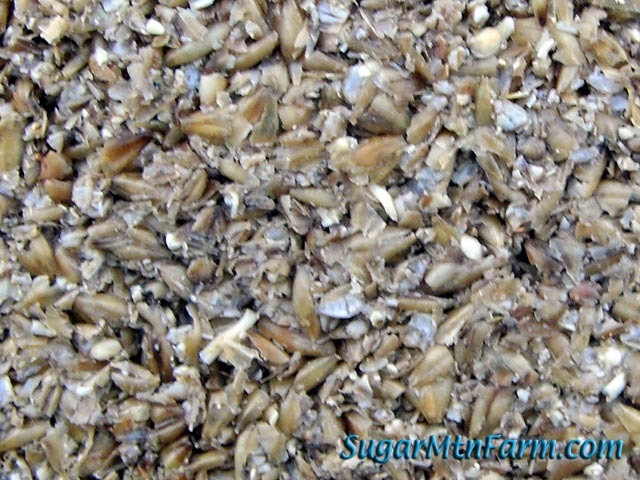 The spent barley is protein, minerals and fiber, pasture is fiber, some sugars, some protein, lots of minerals and vitamins. Hay alone in the winter is a slimming diet. On the diet we do it takes longer to get to market weight but we are patient. It’s a trade off of cost for time. It is important to have the right genetics for the diet. Rotational grazing is key for us. Eggs might be another source of feed for your pigs. Chickens are easy to keep and can feed themselves – that’s how we do it – during the warm months. 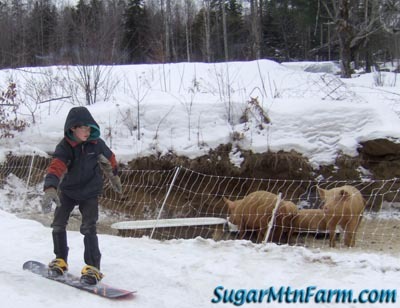 In the winter we feed pigs to the chickens. Ease in to it so you can make small mistakes as you find out what works for your situation with your resources. While this is perfectly true, it’s a little repetitive. You might replace the first ‘left over’ with ‘spent’ instead. Aye, that’s what I had meant to write. Thanks for catching it. I’ve read of up to 50%DMI (Percent Dry Matter Intake) for spent barley however I find that in reality it is best to stay under 25% or it starts coming out the back end wasted – run chickens behind. Larger pigs handle it better than very small pigs. To keep it you might try drying it or keeping it submerged in whey or water if you can’t otherwise use it up fast enough. If it goes moldy then compost it. We only get about 2%DMI so we don’t tend to run into any of these problems. I would love to get 10x as much as it is a good pig and chicken feed. If your pigs are wasting alfalfa by only eating the leaf, and you don’t want to feed too much brewers’ grains as dry matter, maybe grind and mix them? I do not know how difficult it would be to grind alfalfa and mix it with the brewer’s grains, but I figure that a small wood chipper for the alfalfa and a small cement mixer to mix the two might do the job. If you add water while the mixture is still in the cement mixer, it would become something like oatmeal, and the pigs would be utterly unable to avoid eating most of the alfalfa. This might be very labor intensive if you have a lot of pigs, but if alfalfa is a good, cheap feed for you, and it allows you to use all the brewers grains, it might be worth it. What do you think, Walter? I am a first time hog raiser with plans to move beyond my current two hogs if I can iron out the details. So far, I am enjoying the animals and the routine, and finding all the things that need improving. I am trying to work out a balanced and economical diet for my two Yorkshire x Hampshire feeders. I don’t mind waiting slightly longer to grow them out if it means happier (less stressed), more naturally raised pigs, and saves some on feed costs. Being less experienced, I am approaching this with the main concerns of inherent deficiencies of the diet, and buildup/overfeeding of specific foodstuffs (barley, oats). I am currently feeding a mix of approximately 50% SBG, 50% soaked (in fermented dairy and/or left over brine from vegetable ferments – small quantities due to the relatively high salt levels) Oats, supplemented by all our kitchen scraps, some cultured dairy (kefir), and whatever they forage in their wooded pen (~5000 sq ft of brambles, wild raspberries, fiddleheads, and red alder), which they are quickly turning over. Are there any particular deficiencies or problems inherent in these two feed items (barley, oats), at a 50/50 mix? And, other than using their droppings (which appear as uniform, smooth, abundant, dark turds) and obvious signs of distress/disease as a benchmark, how does one evaluate the effectiveness of a diet? A high pasture diet keeps costs down and produces an excellent meat. Add to that what you can of spent brewer’s barley, dairy, eggs, etc. 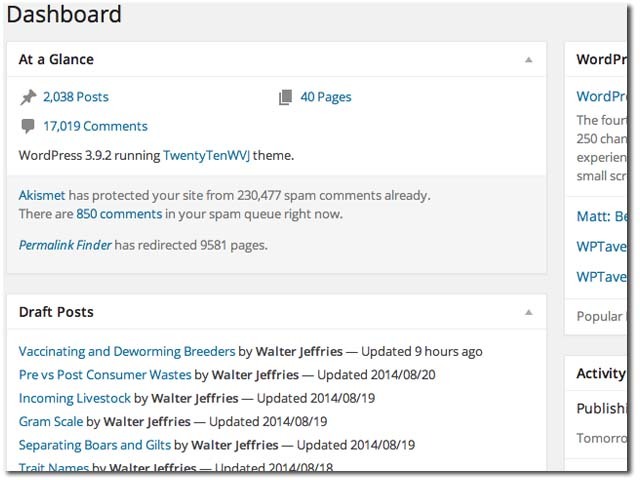 See the feed topics on the Pig Page and follow links from there to details. Ours are about 80%DMI pasture. Plant up your pastures with legumes, brassicas, etc. Sufficient minerals is important. Many soils are low in selenium. Kelp is an excellent supplement. See Mineral Deficiencies. How long does the spent brewers grain stay good for during the heat of the summer? If you spread it out and dry it then a long time. If kept moist and in the sun then days. We feed it out immediately. We only get about 2%DMI so it is gone very quickly with so many pigs. I would love to have 10x as much. Cool, my farm is in central Wisconsin, not far from a handful of creameries. I’ve been talking to one about getting whey delivered. To make it worth the trip it looks like I need to be able to accept a 5000 gallons, which I was thinking about dumping in a plastic swimming pool dug into the ground to keep it cool. They want to sell refined whey based off solids $0.10/lb solids (about the same price as non gmo corn around here). If it was you would you pay that for a more condensed whey (20% solids verses the unrefined 6%)? If I were to just get the straight whey I think I’d have to pick it up myself. I’ve also heard of adding molasses and fermenting the whey, have you heard of this? I wonder if adding apple cider vinegar to the whey to extend shelf life and benefit pigs would be worth while or just precipitate more solids out of the whey. The solids are about 5% to 7% typically so 1/5% -> 1 lb of dried = 20 lbs of whey -> 10¢/lb for solids is 0.5¢/lb for liquids to make it understandable in what we do so no, I wouldn’t pay for that. It isn’t totally outrageous but it is expensive, right up there with buying corn/soy hog feed balanced with needed minerals. But I would accept it for free.